A used Yamaha golf cart can provide significant savings over a new golf cart. 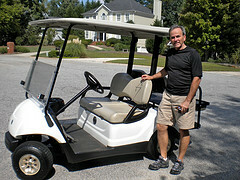 Used electric golf carts can be purchased from a used golf cart dealer or from an individual. It's best to purchase one of the better known makes, such as Yamaha, EZ Go or Club. Why is that? Well, golf cart parts for these carts are more readily available as is help in getting any needed repairs. Yamaha has been around for a long time and has a great reputation for their golf carts. They make a solid and reliable golf cart. A used Yamaha golf cart is a good option when you start looking to purchase or replace your existing golf cart. Local golf cart dealers don't just sell new carts. 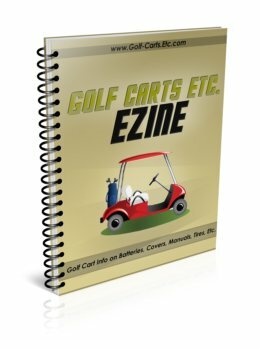 They sell used carts that have been traded in and refurbished golf carts. Depending on the dealer, usually the trade-ins are sold as is. The refurbished golf carts are carts that have been purchased from a golf course that has retired their carts. 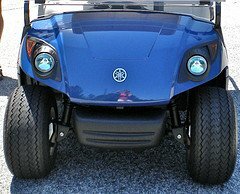 Yamaha golf carts are often the cart of choice for many golf courses. When it's time for the course to upgrade their fleet, golf cart dealers will purchase these carts and then refurbish them. 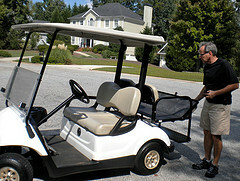 There are several benefits to buying a refurbished golf cart that's been used on a golf course. Golf courses have their golf carts on a regular maintenance program. Usually there has been some reliable and knowledgeable and trained personnel caring for the carts. When a dealer buys a bunch of these used Yamaha golf carts, they will refurbish them. If you are really wanting a cheap used golf cart, then look to buy one from an individual rather than a dealer. Often you can get a cart for a couple of hundred dollars cheaper. 1. The age of the golf cart batteries A new set of golf cart batteries will cost between $500-$600. 2. Maintenance of the batteries Check the water level to see that the water is covering the plates. 3. Check the tires for tire tread. One used golf cart I looked at had no tread left on the tires. New golf cart tires are around $60 each. 4. Inspect the golf cart body. Look for dents and scratches. 5. What is the condition of the golf cart seats. Are the seats stained or have rips and tears. 6. Check to see if the headlights and rear lights are working. Ask if any accessories come with the golf cart. It is expected that a golf cart charger comes with the golf cart. Are their mirrors, a golf cart enclosure, a golf cart radio or heater? Be sure to take the golf cart for a test drive. Try to find a hill to see how well it performs. Places to look for used golf carts for sale are Craig's List, local newspapers, and e-bay. I've found that Craig's List for Atlanta always has a large selection of used golf carts listed.